ONCE THE 10 DAY TIME LIMIT IS UP YOU WILL HAVE 2 DAYS TO PURCHASE ANY PACKS YOU HAVE LEFT– you will not be able to collect anymore arts and crafts items or coins, you have to use the resources you have, if you don’t have enough resources all you can do is use social points to buy the requirements or wait until the event returns! Here you will see you have collected enough items to unlock the Cinema Walls pack! When you unlock each pack, before the items are available in your home store you need to purchase them with the arts and crafts items you make- this goal is coming up! The hi-fi system works like a stereo and the only option on the projectors is turn on so they are quite disappointing! 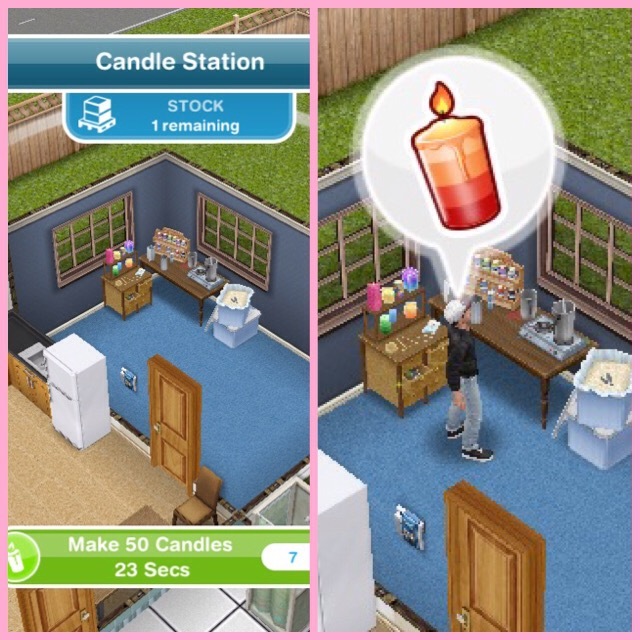 Sims cannot interact with the twin ovens which is a shame but I love the sinks! Is it worth it? Yes! I love this house, it is gorgeous! There is a really nice fountain in the garden of the premium residence too and unlocking this house also unlocks a karaoke machine and aquariums in the home store! It does but I think this one is better! 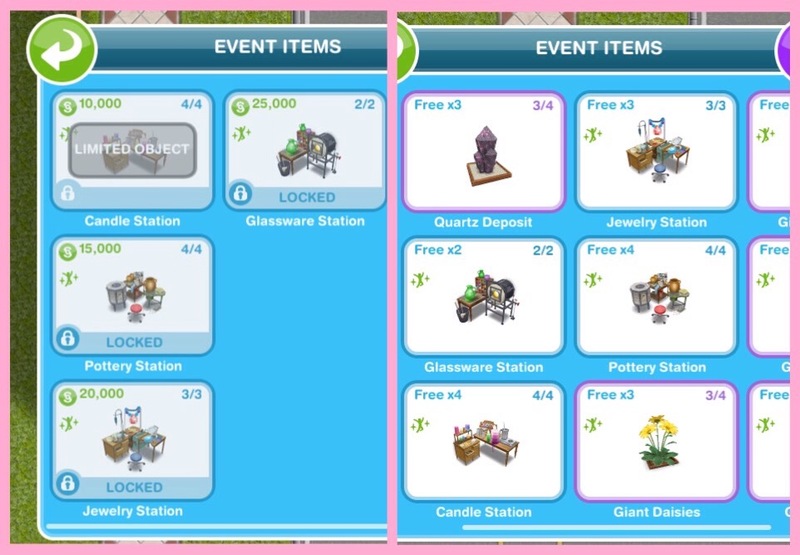 These live events are impossible to complete in the time limit, I have realised this now and I just unlock as many of the prizes as I can then I wait for them to bring the event back again and finish it then so to answer your question, yes you should use your candles on the spin plant but don’t use them all straight away, each day you need to earn 10 constructor coins on the spin plant to complete the daily goal so just spin until you have earned at least 10 coins and then save the rest of your candles for the packs and once you have brought all the packs that cost candles you can then use them all on the spin plant. I’ve managed to complete most within the time limit with some careful planning …some of this I’m sure you all know but just to reiterate. 1. Do NOT buy prizes unless you need them for your daily bonuses. The bonuses are the absolute easiest way to get guaranteed constructor coins. If you hit one of the constructor coins or social point bonuses based on your materail, that counts for the “unlock or buy a prize” bonus. 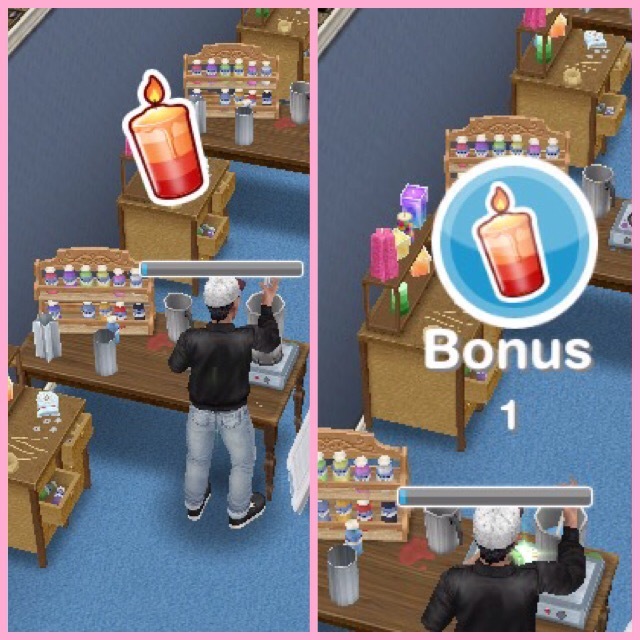 When I first started doing these events I would buy prizes as I got the ability to do so…meaning I didn’t always have enough candles to spin the wheel for collecting those bonuses, and if all prizes were already unlocked except the ones I really had to save up for, I couldn’t get the bonus for unlocking/buying a prize. 2. 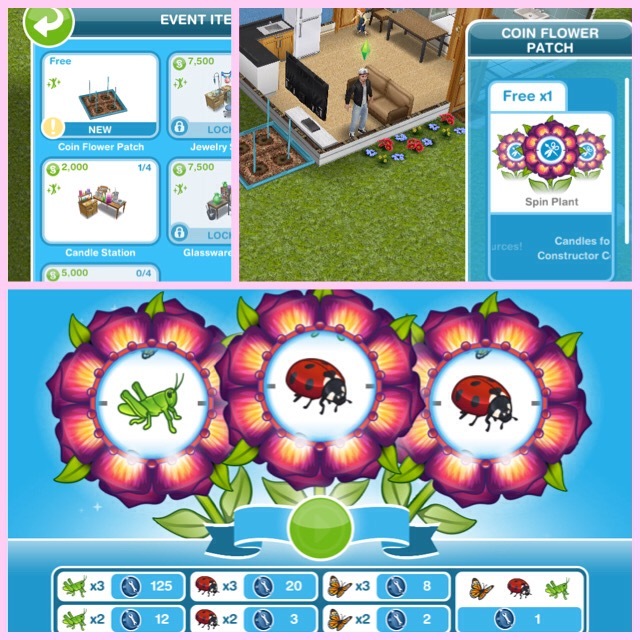 Plan around which time to use – 2.5 hours gives the best amount material for the time but sometimes an alternative is better – If you have time to collect one more set before bed, choose the 6.5 or 8.5 option depending on how long you sleep so that you are collecting bonuses while you are awake and material all night, and restock in the morning, instead of restocking while you are asleep. 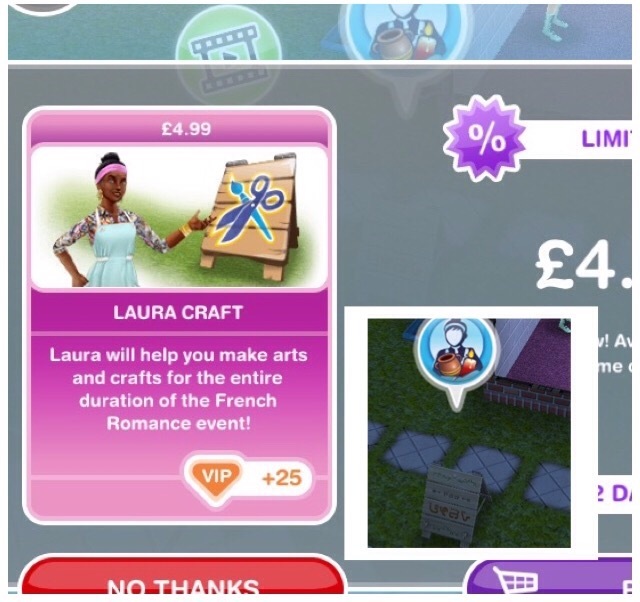 Oops – clarification to my other comment on #2 – If you have time to collect one more set before but and only have one more available usage on that craft station, then select the longer option. Why isn’t the update available to me yet?? Do we have to do a special quest or be on a specific level to avail this update?? You can’t find the update in the app store where you downloaded the game from? Thanks for all the info on all the quests and events. I’m almost done unlocking the last prize. I had my sims crafting round the clock for it. Can’t wait for the luxury house. You’re welcome, I’m glad you have almost completed it! Do you think this live event will come back soon? If so, will the previous progress do saved? This event was brutal. I thought a few of the last events they had eased up based on our requests. But this one felt back to being impossible within one go round. I only managed it because I had been planning on using some gift cards on some store stuff anyhow, two of which were the SP/LP cards and only just managed to have enough SPs to buy the last pack to unlock the house. And oI came down to the wire, hoping once my sims finished right before the final minutes there’d have been enough items to drop the SP purchase within the amount I already had prior to purchasing the SP card. No such luck. I guess the developers won this time and I did make the purchase…otherwise I would have just had to grumble about having an almost-but-not-quite complete collection and no house or pretty fish tank for however long it takes to come back. Is there a specific wall I have to place the projector in? I have plenty of wall space and it still won’t let me place it. Do you have a window on that wall? Anything on the wall already will need to be removed before you can place the projector. I do not think I can finish it all in time. Less than two days left. Do you think it will come back again? And if so, when? And would I have to start everything from the beginning or from the point where I stopped? These events usually return a lot, there is no set date for the return as it does vary but I am sure it will be back again one day. When it returns you will start from where you got to this time. Love your site, use it all the time even though I’ve been playing for about a year. I do have a question about the luxury live event. If you haven’t unlocked the house (final prize) within the time frame because 1 of the earlier prizes hasn’t been unlocked, once you unlock it will the house be unlocked even if it’s after the time limit is up?